Following Left Foot Forward’s contradiction of David Cameron yesterday over his claim the stroke unit at London’s Royal Free Hospital was under threat, his health policy continues to unravel. Today’s Times criticises the Tory leader’s plans for a new executive board for the NHS, which would effectively be a super-quango with a £100 billion budget – at odds with Mr Cameron’s much-vaunted “bonfire of the quangos” speech in July – and the the independent Health Policy Insight (HPI) has pointed out what they call his “Bogus disbelief on nurse’s paperwork time”. 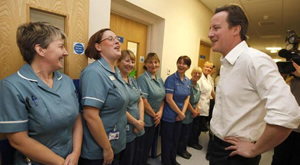 “Cameron also suggests that ‘it is an astonishing fact that nurses spend a million hours a week on paperwork’. But nurses deliver front-line care, which has to be recorded to make handovers and judgments safe. “As hospitals continue to treat older and sicker people (the ageing population thing, innit? ), technical medicine and good, upt-to-date [sic] data is only getting more important. “Yes, it would all be much better if every clinician (nurse or doctor) had a hand-held electronic device, to record the data in real time, warn of adverse drug reactions etc … it also is perfectly technically possible. But we’re not there yet. So the job will involve a lot of paperwork. “In 2007, there were 307,628 full-time equivalent nurses, midwives and health visitors. There are probably a few more now, but those are the figures I can get easily from Hansard. “So to get to Dave’s ‘astonishing’ million hours a week on paperwork, those 300,000-odd nurses are doing about three-and-a-quarter hours’ paperwork a week.